After the resounding success of our first ever advertised public demo in Aberdeen for fellow patriots, fellow patriots have asked me to write up an effective blueprint for further usage by fellow patriots on future demo’s. So after the resounding success of our first ever advertised public demo in Aberdeen for fellow patriots here are some top tips, some dos and dont’s and a few handy pointers that can help avoid any funny gaffs or blunders….I hope you enjoy having them read out to you as much as I enjoyed drawing them out on paper with a big crayon while my carer interpreted my ravings into simple ENGERLISH for my fellow patriots to understand. Location: Effective demonstrating is all about location. 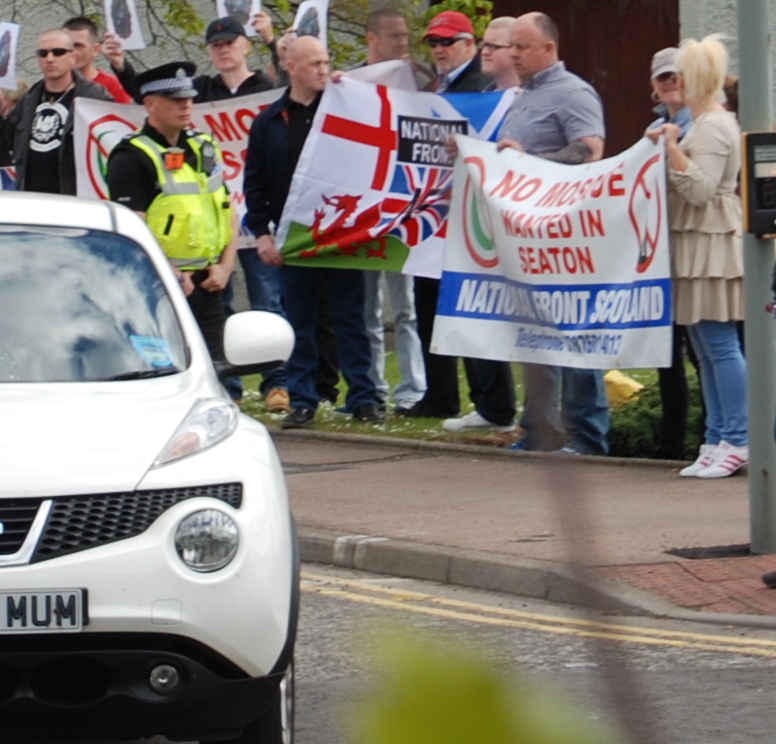 As we were trying to galvanise the local community in Seaton (the community being affected by the building of the Muslamic terror centre or MOASQUE) we chose to hold out demo outside of Seaton, thus attracting no members of the community to our demo. 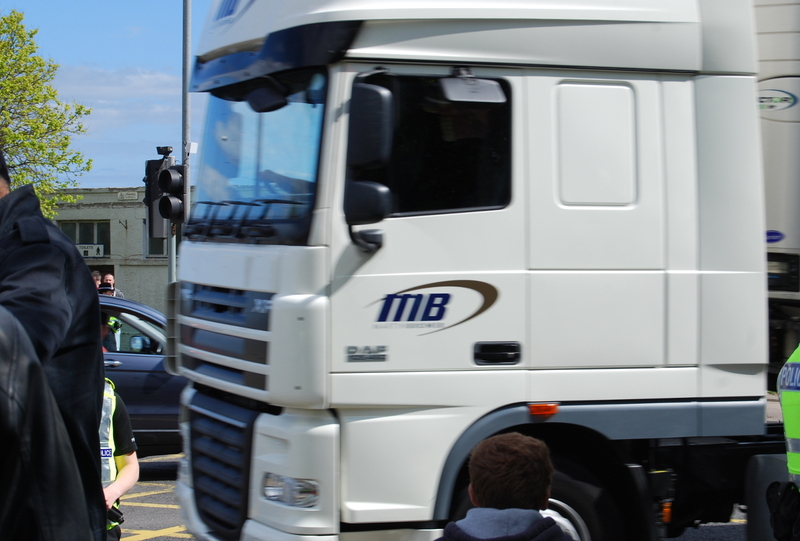 It’s also important to choose a location that will allow you to interact with the public and get your message out. 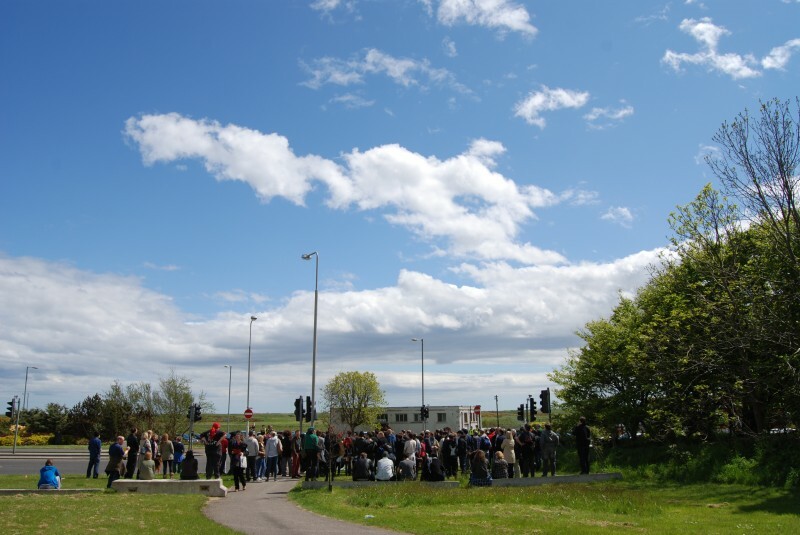 For our first ever advertised public demo in Aberdeen for fellow patriots we chose to stand outside a disused public toilet, behind a busy petrol station, beside a very busy road that attracts absolutely no pedestrians. I must admit that I chose the location for sentimental reasons. I have spent many a happy hour in those public toilets when I was a lad, and they used to be very busy. Loads of guys used to hang about them, not any more it seems, probably due to public sector cuts. 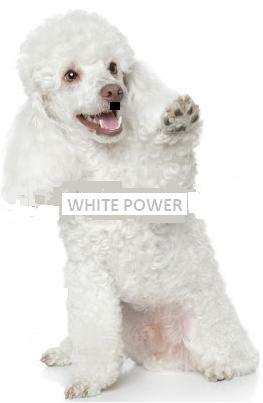 When I’m Fuhrer (Sieg Heil!) there will be public toilets everywhere! Image: They say that politics is Showbiz for ugly people which is why I’m standing to become a member of the European Parliament. 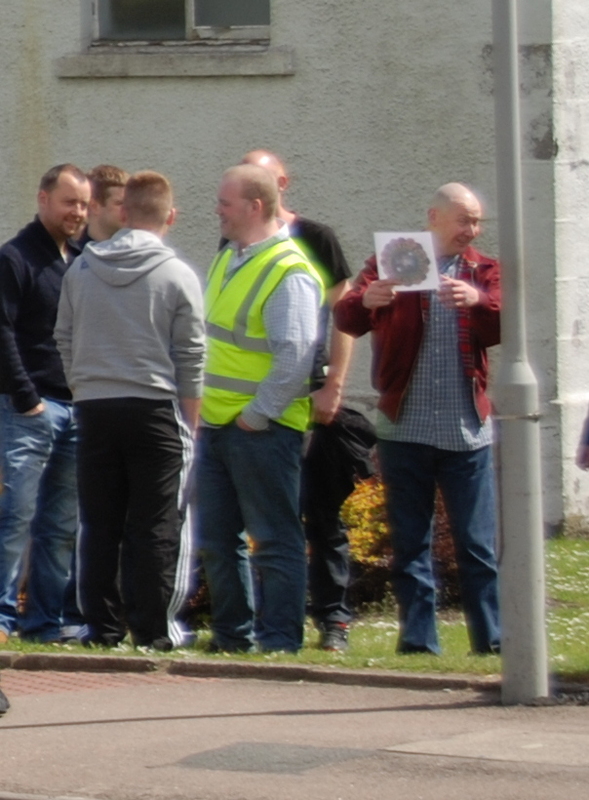 Joking aside, we here at The National Front do take our image very seriously, which is why on our first ever advertised public demo in Aberdeen for fellow patriots we chose to have our most manly and handsome patriots on the outskirts of the demo to entice the passing general public into our warm loving embrace. Is there anything more stirring and erotically charged than the shining knights of the master race on display? Proud, erect and well shaved? I think not. And as you can see we chose to stick to the classic family friendly 1970’s racist skinhead look and the never out of fashion 1980’s soccer casual look. Large shades and close fitting baseball caps are also handy just in case you don’t want neighbours/workmates to know you’re a racist. It saddens me that modern politics has become all about policy and not image. There was a time when all you needed to succeed in politics was a smart flick, a tiny moustache and a liking for mass extermination. Rest assured voters when I’m in charge every man, woman and child will be forced to cultivate a tiny moustache (Sieg Heil!)!!! Posters: Remember to have lots of leaflets to hand out to the thousands of people who will be passing your demo. We forgot to take any this time but as we had no members of the general public pass by it worked out as a saving for the party. This is just one example of the sound fiscal policy’s I will be implementing when I’m voted in as a MSP. Remember, Vote Racist! Vote Davie! And don’t concern yourself with the wishes of the parents of a young man who was brutally murdered on the streets in London, use the victims name and image for your own political / financial gain and to spread an agenda of hatred. This is a policy that is guaranteed not to backfire on us in any way! So, Vote Davie! Vote Racist! Speeches: Remember to bring along a P.A. System or megaphone so you can address fellow patriots and the thousands of members of the general public you will attract with a fine speech. Don’t forget to use LOTS of hand gestures when speaking. 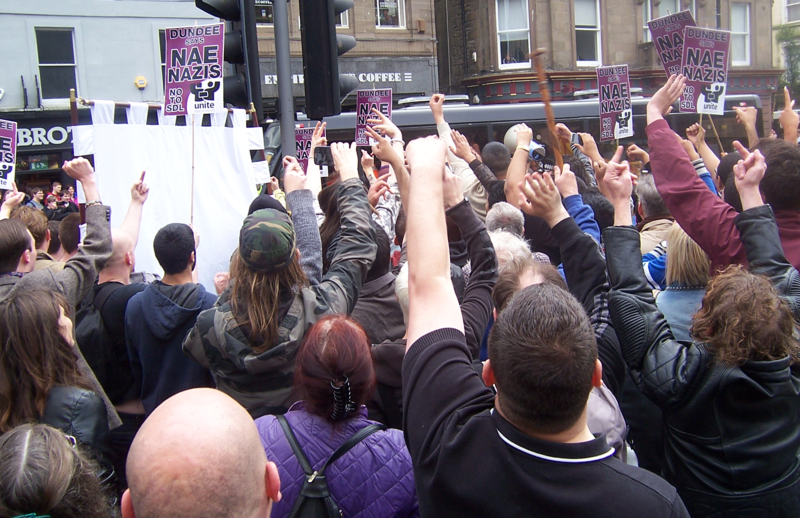 We forgot to take our mega phone this time but the passing cars, buses, lorries and the hundreds of Anti-Fascists across from us would have drowned out the speeches we would have made anyway, had we had any ready. We did lots of hand gestures though! Punctuality: Hitler ((Sieg Heil!!)) would be spinning in his grave if we turned up late at our own demo! Finally, the most important thing to do out there is have fun. Having the ability to laugh at yourselves is essential. Thousands and thousands and thousands of non patriots (like those in the picture below) will come and point at you and laugh, make rude finger gestures, possibly even throw things. Silver haired grandma’s may even come up and spit on you, small children will run away screaming and passing vehicles of all sizes will try and run you over so be prepared to smile politely and hide behind a beard free police man. Remember when we win all these millions of people who clearly think we are idiots will get theirs! Cheers Davie, good luck in the next elections! 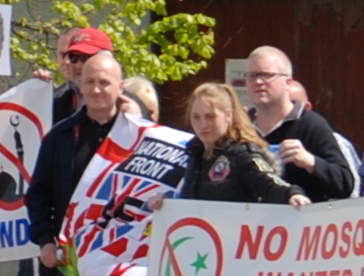 The National Front have announced their plans to demonstrate in opposition to a proposed mosque in Seaton. 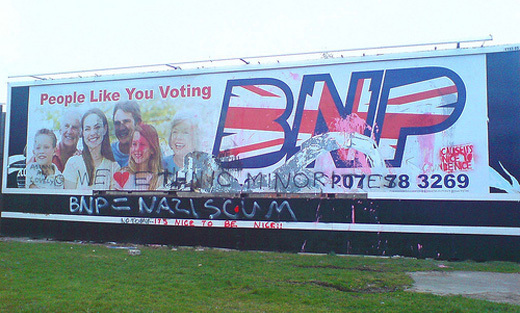 It is vital that the NF are shown up as the out-of-touch, bigoted minority that they are. 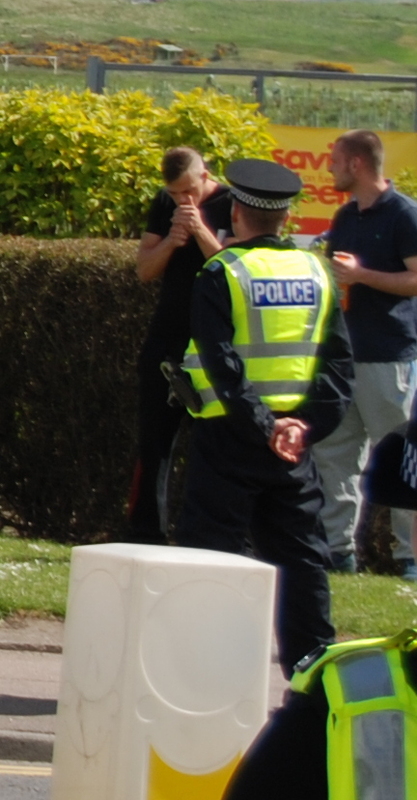 This counter-demonstration is to show that their racism and fascism are not welcome in Aberdeen. The National Front describes itself as a White Nationalist organisation, and is founded on ideas of segregation, fascism and hatred. In light of recent events in Woolwich, racist assaults, attacks on mosques and open bigotry against the Muslim community have increased dramatically. This can only be beaten by collective, community action. We need to show, now more than ever, in the streets, that Aberdeen stands united against hatred. Join us at 1pm on King Street (outside Lidl), and we will show them that we will not tolerate racism. Hasta La Vista – Madrid! Aberdeen Town and County History Society invite you to an evening remembering the Aberdonians who fought in the Spanish civil war. 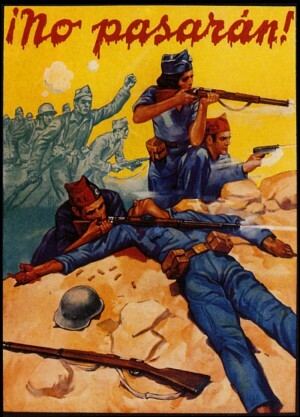 Local councillor Neil Cooney who is presenting the talk will take us back to the turbulent 1930’s when the brave citizens of Aberdeen not only cleared the streets of the city of Fascists, but then went on and fought against Franco and Hitler’s war machine in what is now looked upon as the first acts of World War II and the first major resistance to Fascism in Europe. 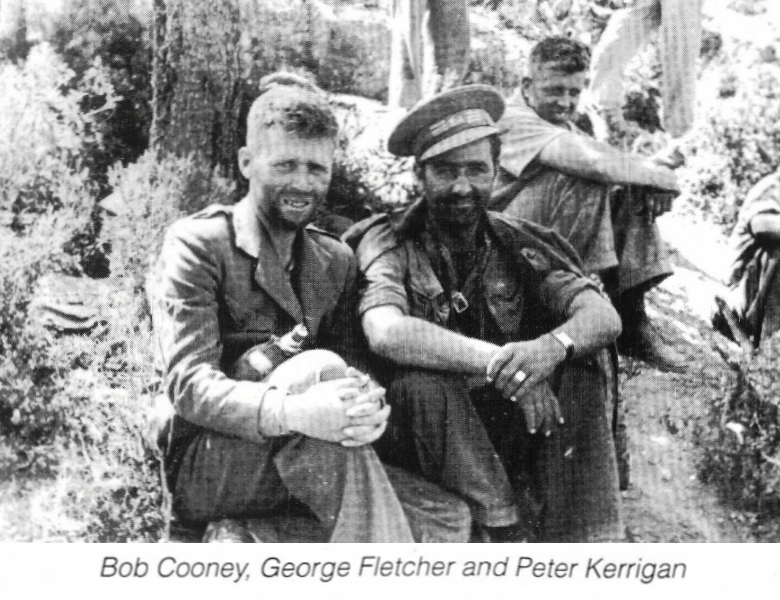 There was a time when fascism was not tolerated in Aberdeen. And as the fascists are raising their heads in the city once more talks and events like these hold ever more importance for us today and for future generations. 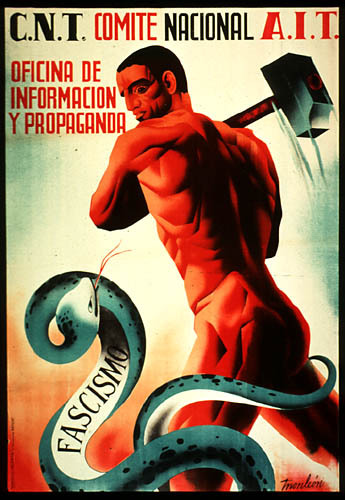 Fascists will always need a target, be it Jewish, Gypsy, people of colour, homosexual or Muslim. They strive to divide the working class at the bequest of their paymasters. Is it any surprise we find out our newest far right groups (the EDL & BFP) are sponsored by shady millionaires like Alan Lake and Ann Marchini. And as we now also have National Front members in our community councils it would be nice to think that the people of Aberdeen will start to remember their own history better and be proud of it! George Santayana once wrote “Those who cannot remember the past are condemned to repeat it” and it seems his words have never been more relevant than today. A small admission charge of £2 for non members covers tea & coffee costs. Seems like the sneaking suspicion we had at A.F.A. 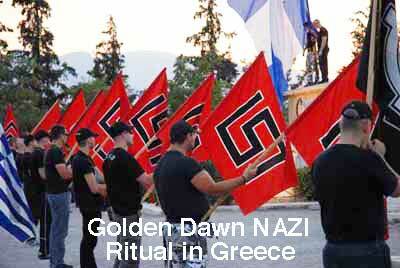 towers about the Greek police & the Golden Dawn being thick as Nazi’s snuggling up in a sleeping bag of hatred was right on the money…. sometimes it’s good to be wrong…. Please follow the link for more details – Be warned it an MSM article – And be warned this may be coming to a police station near you! Check it one times, a decent bit of reporting with some interesting stuff and true facts….. 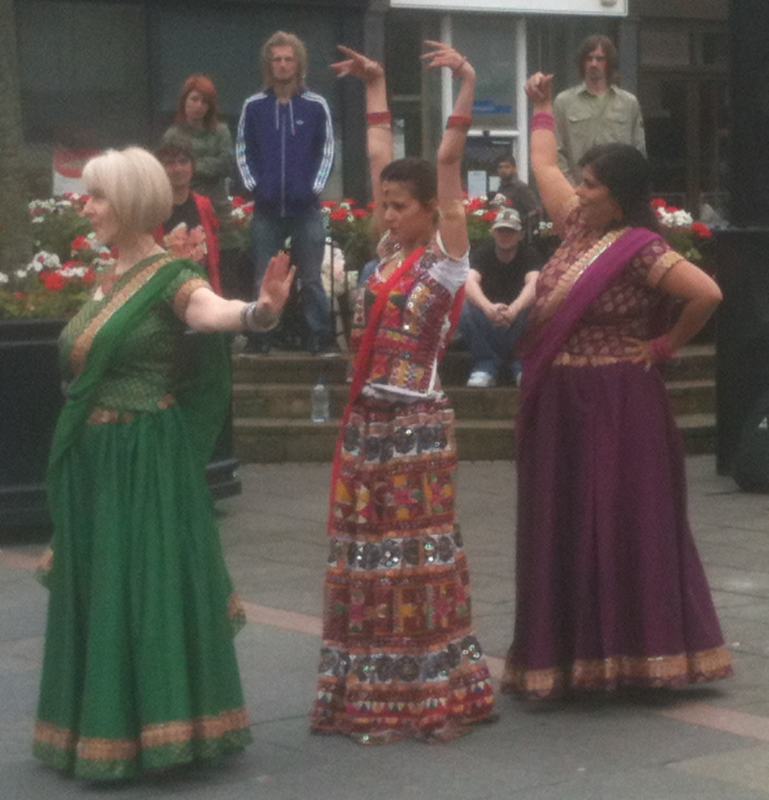 The good folks of Dundee can put on a show when necessary. And any time the Stupid Defence League congregate to spread their message of hatred it’s necessary! 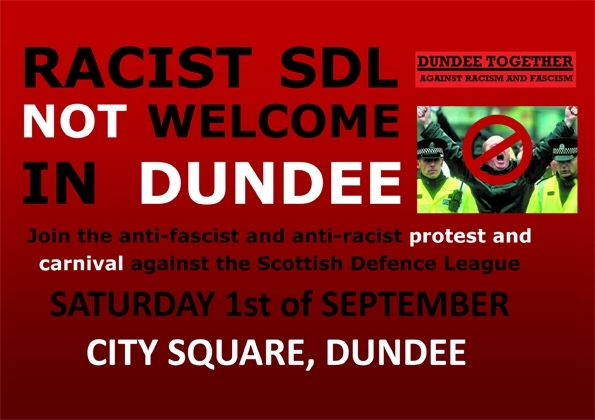 Dundee didn’t let themselves down on 1st September, and hopefully the SDL winna be back anytime soon. 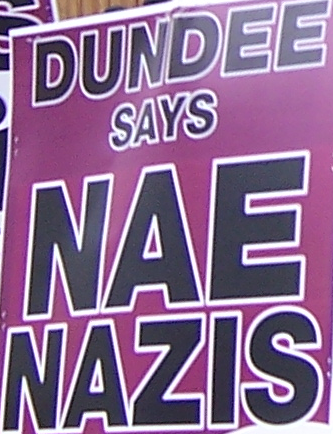 Dundee Together was a happy mix of the people of Dundee, Scottish Anti-Fa, the Youth League of Muslims, Scottish Palestinian Solidarity Campaign, Unite Against Fascism, Dundee Mosque, Stop the War Coalition, Hope not Hate, Dundee & Aberdeen Anarchists and the SWP. 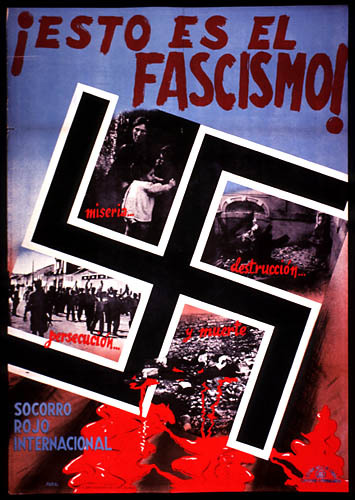 We were all capably brought together by the Dundee TUC and their many volunteers who donated time and energy to make sure the city remained fascist free. The day started with a wander around the stalls, some breakfast and a catch up with people we don’t see often enough and then we were off to the first seminar of the day. 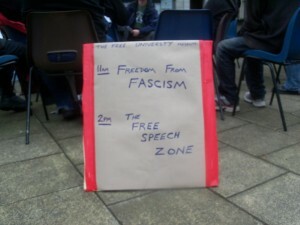 The Free University held an open session exploring 2 different view-points of fascism: the external and the personal. Some very interesting points were raised and a good discussion was formed. One thing raised during the discussion that particularly interested this reporter was the irony of a “left wing” Labour Government under Blair & Brown accelerating the right wing Neo-Liberal economic program started by Thatcher in the UK- economic fascism. While the musical entertainment began on the stage, roving bands of concerned citizens were out and about keeping all eyes peeled for the Sober Defenders League, but there was little sign of them. Rumours of their locations abounded but we figured that the tiny cage surrounded by lots of cops just beside a shopping centre would probably be their final destination. Around about 1pm, the collective intelligence of the city took a massive drop. It was as if a massive cloud of STUPID had arrived and settled around us. But what, where or who could it be? The rattling sound of sick and lonely brain cells bouncing about shaved bone headed skulls announced the imminent arrival of the mighty defenders of Scotland from the Muslamic hoards. 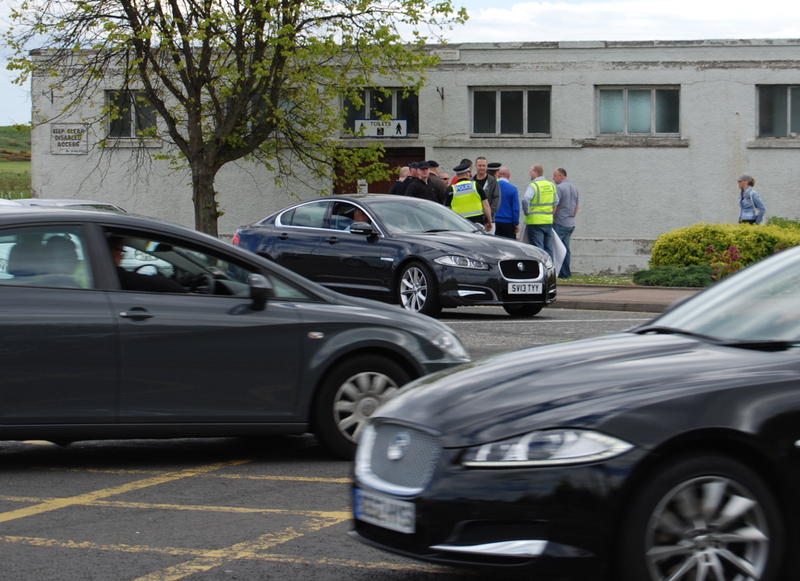 So, the mighty neon clad defenders of the SDL, the cops, escorted them into their pre-arranged neon police kettle. Kettled fascists. Is that like potted heid? Soon hundreds of locals had kettled the police kettle that had already been set up to kettle the racists. "There are many, many more of us than you....."
We spent a pleasant hour shouting much louder than the paltry band of racists before they were escorted back onto their buses and out of the city. 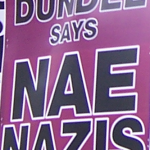 A note of thanks really must go out to all the guys and gals of the North East Infidels, SDL Borders Division, EDL SDL and other assorted bald middle-aged racists who made the trip up to Dundee. It’s due to their commitment and sterling work that communities throughout Scotland, of all races, religions and age-groups are coming together and extending understanding toward each other. 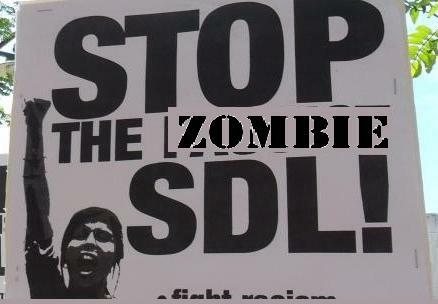 Without you guys of the SDL to motivate people our communities may remain divided. So please keep up the good work. Don’t go changing ya’ hear! 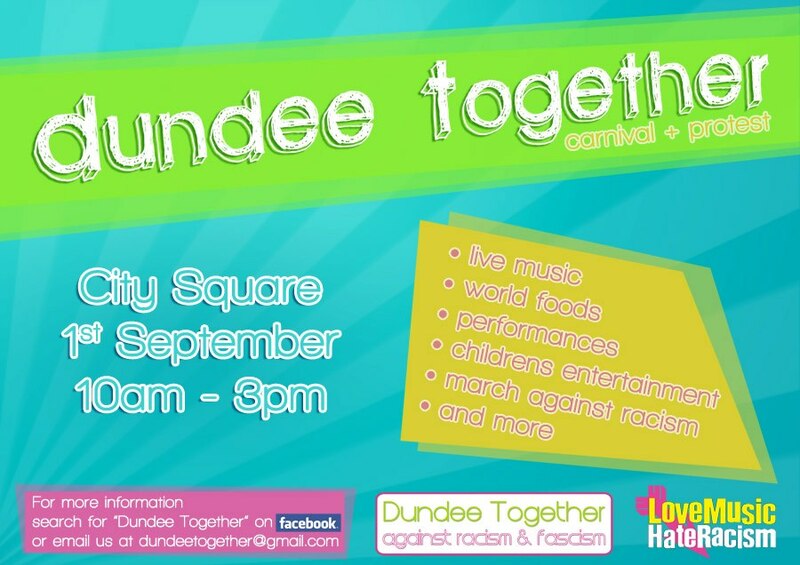 Dundee Together – Saturday 1st September. corner, workshops, street theatre an much more. 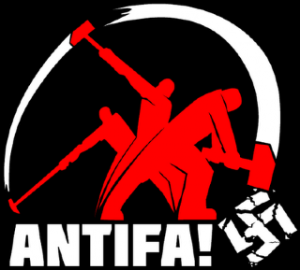 fascist group has dared to raise its head in the city since 1990 so lets not let em! 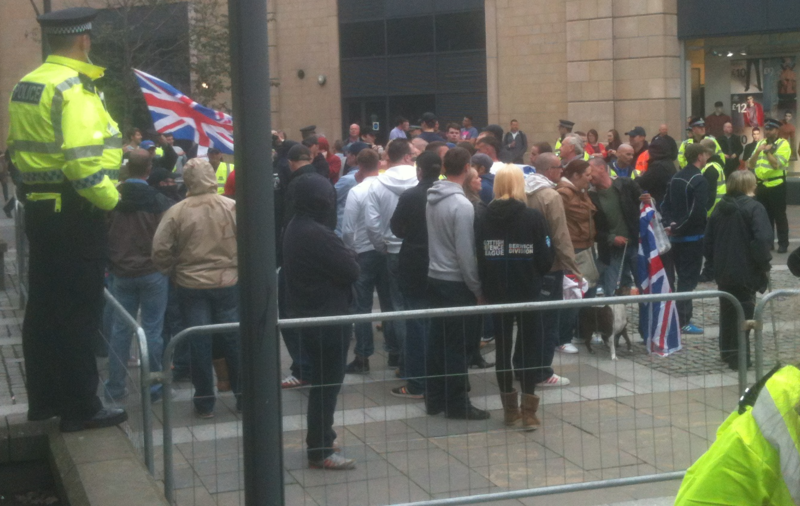 Aberdeen National Front today launched there new initiative to introduce British breeds of dogs to Muslamic countries. 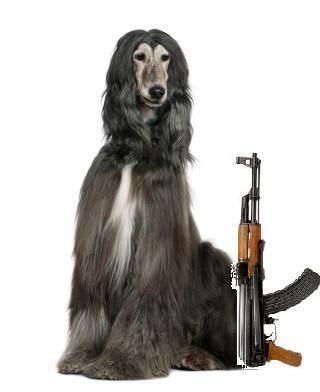 Alarmed by the recent increase in Afghan hounds in the UK- while we are still technically at war with them – Aberdeen NF are planning to parachute traditional British dogs into Afghanistan to combat this vile threat to our BRITISH WAY OF LIFE! And to our beloved world famous dog shows like Crufts and the Stonehaven All Comer Annual Poodle Championships. Aberdeen NF have created a secret training camp in Seaton where BRAVE BRITISH dogs, such as Bulldogs, Labradors and Poodles are undergoing a rigorous “P-Company” style parachute regiment training in preparation for their dangerous mission to combat the Muslamic hordes of hippy dogs who possibly also have beards. A known BRITISH dog, off to protect our way of life. 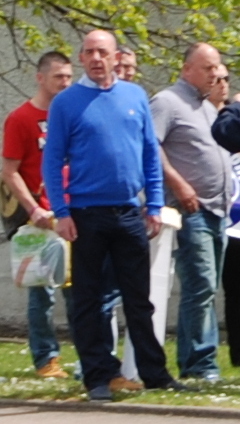 Aberdeen National Front’s Leader and champion Poodle breeder (Stonehaven All Comer Annual Poodle Championships – Winner 2009 and runner up 2005) is the man behind this fantastic scheme to preserve our BRITISH WAY OF LIFE And to help keep the Muslamic hoards and their pets at bay! 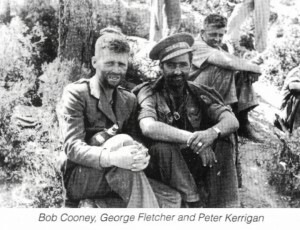 Notice the beard and gun! “If you see an Afghan hound in the street Inform a policeman immediately…immediately! Vampire Muslamics! The BRITISH way of life’s worst nightmare! Cheers BawBug – Keep taking them pills and good luck next election. 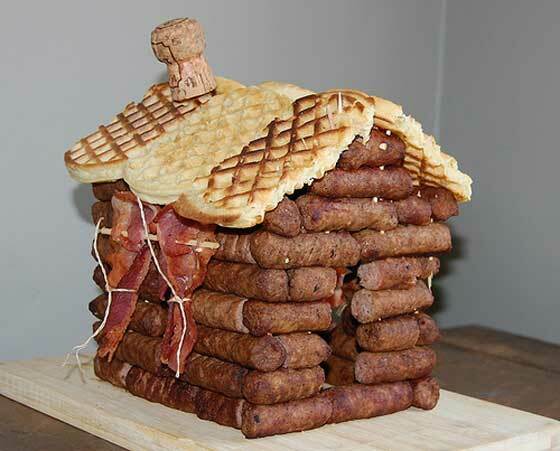 A gift to you, our lovely readers! With autumn just around the corner and the summer’s fun almost over everyone here at A.F.A towers is gearing up for the next big event and with this in mind, dear reader, we are offering you a unique and fashionable chance to be the absolute envy of your friends and family…. So, don’t forget to keep saving those tokens and send them to us for your ABSOLUTELY FREE pop out and keep, once in a lifetime offer of a unique and very valuable, ABSOLUTELY FREE…. That’s right collect all 84 tokens and then simply send £499.99 to cover postage along with the size of your choice and just in time for Halloween or Crimbo latest you will receive our special once in a lifetime, one size fits all, ABSOLUTELY FREE, SDL Zombie Costume! Amaze and scare your neighbours this October 31st as you stumble down your street, grunting and moaning in very basic human and affecting a barely upright shuffle, swigging from your very own spooky tin of ‘Ghostie O’ Lager’! Worry you’re friends and family with both fright and shame as you feel the urge to congregate in very small numbers in day-glow circles of police persons as passersby mock you without you quite understanding why! 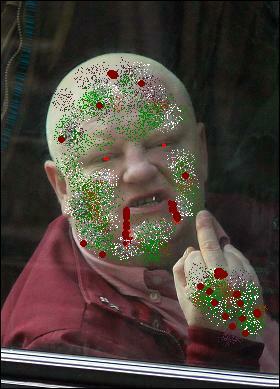 The police use the racist Zombie’s unexplained attraction to Neon green to good effect. Miss-spelt racist flag option available on request! Stay tuned for our next edition which features our fabulous “How to spot em Guide!” A very handy tool to help our dear readers identify any racists that congregate in their city or town… Next month it’s on the elusive and beautiful EDL Angel, fantastic stuff I’m sure you’ll agree. UAF Scotland are organising a rally in Glasgow on the 28th July 2012. Please gather at 12pm in Buchannan Street. This will be only one of the many responses on the streets that day to the BNP trying to set up a political stall in Glasgow, again. Various groups of Anti-Fa will be ensuring they get a warm welcome. Please take banners and placards and facemasks. There will also be poetry, music and various speakers. The demo finishes at 2pm.